We are proud to announce that the latest version of PHPKB (v7.5) is now available. It can be downloaded from the customer area if you have an active support and maintenance subscription available. The new version of the product introduces a number of significant changes such as performance enhancement, several improvements and a variety of new features. Have a look at new features, bug fixes and list of improved items given below. You are most welcome to try out our new features, and provide feedback on any issues you come across. 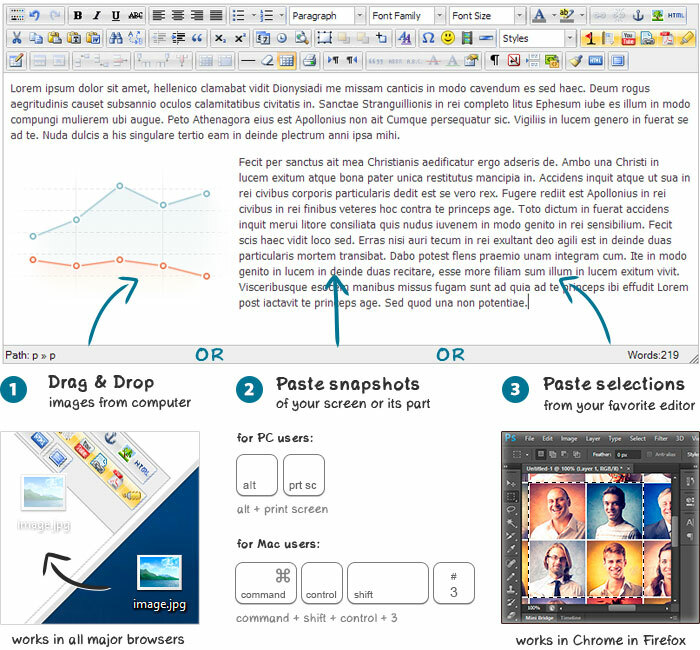 PHPKB now offers you the ability to paste images directly from the clipboard OR drag & drop local images from your computer directly into the WYSIWYG Article Editor. This feature saves tons of time when adding images into your articles. Have you wondered how many steps you need to follow for adding an image in your articles? For example, adding a screen snapshot or a selection area from Photoshop or a photo somewhere on your hard disk? We bet you could add images more often and make your articles look more attractive and user-friendly if it didn’t take so much time! You can understand it if you write how-to guides, tutorials, troubleshooting information, news or just articles with a lot of pictures. Version comparison facility has been added in Enterprise Editions of PHPKB software that can compare and find the difference between two versions of an article. This allows you to compare an article with any of its previously stored versions side-by-side. After comparing two versions of an article, PHPKB provides the details of every change. Changes are highlighted so that you can know what text was added, changed and/or deleted. This module allows the administrator to restrict/allow access to the knowledge base to a pre-defined set of IP addresses. Anyone trying to access the knowledge base from an IP address that is not in the list of allowed IP addresses will be redirected to an access denied page with the message "The access to this knowledge base is restricted". This will happen for all public area pages these users try to access. To add an IP address to the IP Allowed/Block list, go to "Tools" section of admin control panel and specify the list of allowed/restricted IP addresses in its respective field. Your knowledge base articles are more SEO-friendly now. PHPKB 7.5 adds schema.org markup to articles on your knowledge base. With article schema markup implemented on your knowledge base articles, Google may make the information available as rich snippets on search result pages or in other Google properties. Information such as an article’s title, author, content and review ratings can help users decide which pages to click on in search results. This results in improved visibility of your articles in Google search results. Schema.org is a collaboration by Google, Microsoft, and Yahoo to improve the web by creating a common vocabulary for describing the data on the web. If you add schema.org markup to your articles, many companies and products including Google search will understand the data on your knowledge base. Group-based access for Admin Users in Public Area of the knowledge base. This is applicable on "Writer" and "Editor" level admin users that are a member of an "Admin Group" so that they can access only those private categories on the public area that are assigned to their admin-group. Knowledge base search has been completely revamped to offer the best search experience to your knowledge base users. It does an even better job this time to find the most relevant search results for a query. A new option "Notify Subscribers" added on "Edit Article" page as a checkbox so that you can select if you would like to send notification emails to article subscribers or not. This is very helpful when minor changes are made to an article (such as spelling corrections) and you do not wish the subscribers to receive email notification about it. Auto link glossary feature has been improved and now uses client-side linking (via jQuery) instead of server-side linking of glossary terms in the article content. It not only improves the performance but also fixes the issue with linking of glossary terms that contain special characters in them such as German Umlauts. Some new language variables have been added to the multi-language versions of PHPKB software. So, it is suggested that you re-configure each of your existing language files to fill up the language content of those variables. Send an email notification to the superuser (KB Administrator) as well as to Category Editors whenever a new article is created (pending for approval) by the writer. Send an email notification to the superuser (KB Administrator) when a new comment is posted (pending for approval) on an article. Account lockout facility improved if someone exceeds the specified number of failed login attempts (for both admin login as well as public area login). Paging facility has been improved to display a list of page numbers in a drop-down select menu so that you can jump directly to a page. This has been implemented on all manage sections of the admin panel such as "Manage Categories", "Manage Articles", "Manage News" etc. PDF generation code using TCPDF library is pre-integrated in PHPKB 7.5. It is helpful in that case when the default PDF generation library (HTML2FPDF) fails to generate the PDF document as well as customer’s hosting company is reluctant (for shared hosting customers) to install WKHTMLTOPDF library for them. All POST variables will go through another security layer to prevent any XSS attack. Files attached to private articles can only be downloaded by users with access right to those articles. In SQL Server packages, file upload setting issue has been fixed. Earlier, changing the "File Upload" setting through "Manage Settings" page was not saved properly. In Enterprise Editions, there was an issue detected where internal users (using the LDAP connection) can connect to the knowledge base using anything as their password. Of course, they needed to enter in a valid network username/email address, but the first time they connect (which creates their login in the knowledge base) they can enter in any password. Any subsequent logins require them to enter in their valid network password, but not the first time. This issue has been addressed and fixed. When "Simple SEO URLs" setting was turned on and if a user switches from one language article to another then language translation does not load. This has been fixed. Article rating stars alignment issue has been fixed for all Multi-Language Editions. Fixed issue with "create new folder" and "delete folder" features in Asset Manager. Image dimensions fix for Internet Explorer where image dimensions get changed to "NaN” in certain cases. Fixed issue with "Edit Article" page so that email notifications should not be sent to the article subscribers if the article is marked as "Not Visible". "Access Denied" message fix when someone tries to view a protected resource (private article or category) to redirect them to the login page and after successful login, redirect them back to that protected resource. Edit Comment feature has been fixed so that "Comment Approved" email is not sent again to the user if the comment is already approved. You can download v7.5 from your Customer Area. If you would like to preview and test it before using on the production environment, we recommend that you install it on a test system, not on your live knowledge base.